HIROKO SAKAI Fine Art Gallery - Press - "Japanese women thrive in Bay Area arts scene"
About > Press > "Japanese women thrive in Bay Area arts scene"
On a recent Friday night, fashionably dressed young Japanese men and women jostled in a downtown gallery, sipping wine and celebrating their own - six artists based in the Bay Area who were showcasing their paintings and photos. "My photography is simply a challenge to try my creativity as an artist and a designer," said Akko Terasawa, 24, a photographer and graphic design student at the Academy of Art University who moved to San Francisco in 2004. "I really don't know many women photographers in Japan. Most famous photographers there are male." Young, creative and ambitious, Terasawa exemplifies the typical modern Japanese emigres who are flocking to the United States in search of artistic and personal freedom. More likely to be female than male, many are inspired by cultural icons such as musician Yoko Ono and conceptual artist Yayoi Kusama, both of whom became famous after coming to the United States. More than 60 percent of the 39,400 foreign-born Japanese living in the Bay Area are women, according to the Census Bureau's 2006 American Community Survey. Some come to study English and art and move back upon graduation. Others stick around to test the waters of the local art scene, find a job or get married. "There is a strong ambition to go abroad," said Karen Kelsky, head of the department of East Asian languages and cultures at the University of Illinois at Urbana-Champaign. "They simply don't believe they can accomplish their goals in Japan." Female artists, especially, face obstacles in the elitist conservative Japanese art world, said Midori Yoshimoto, author of "Into Performance: Japanese Women Artists in New York," which profiles Japanese artists living in the United States in the 1960s. "The situation has changed over the course of 40 years. It is somewhat better now," Yoshimoto said. But many female artists "still cannot stay in Japan because the art world is very conservative there, self-confined in a traditional mold." Home to the world's second-largest economy, Japan nonetheless lags behind other countries in addressing the gender gap, with women largely absent from top-level executive and political positions, according to the 2007 Global Gender Gap report by the World Economic Forum, a Swiss-based think tank. Japanese women hold 10 percent of senior corporate positions, compared with 42 percent in the United States, the report said. Last year, Hakuo Yanagisawa, the health minister of Japan, described women as "baby-making devices" in his speech on population decline, encouraging couples to have more children. "Right now, Japan is ruled by my father's generation - typical Japanese politicians are 60 or older," said San Francisco artist Ayu Tomikawa, 36. "I think truly modern Japan might appear when my generation" reaches that age. Growing up in a remote village in the south of Japan, Tomikawa wasn't expected to do well in school, but to get married and have children. Instead, she moved to San Francisco, dyed her hair pink, sang in a female punk band, and became famous in the local art scene for her woodcut prints featuring fantastic adventures of Hato the alien. "There was another reason why I came to U.S. other than getting into an adventure - I wanted to be (away) from my authentic samurai-type father," Tomikawa said in an e-mail. "He probably does not approve what I am doing." While more women have entered the workforce in Japan since the 1980s economic boom, they often earn a fraction of what their male colleagues make, have fewer prospects for promotion, and are looked down on if they stay single and keep working past their mid-30s. "I felt like I was born in the wrong country," said Aya Kinoshita, 38, a photographer and writer who came to study art at Holy Names University in Oakland when she was 22. "In Japan, you have standards about everything, and neighbors are watching you - you have to marry, you have to have a baby." Kinoshita got a job at a Japanese cosmetic company in Silicon Valley, where she was expected to work long hours with little compensation, serve tea during business meetings, and walk two steps behind her male co-workers. "I didn't want to accept that because I was in United States," Kinoshita said. "I feel more freedom here. I don't have to meet anybody's expectations." But the quest for a new lifestyle sometimes comes with a price. Many Japanese women say they have had to learn new rules for relationships, friendships and love. 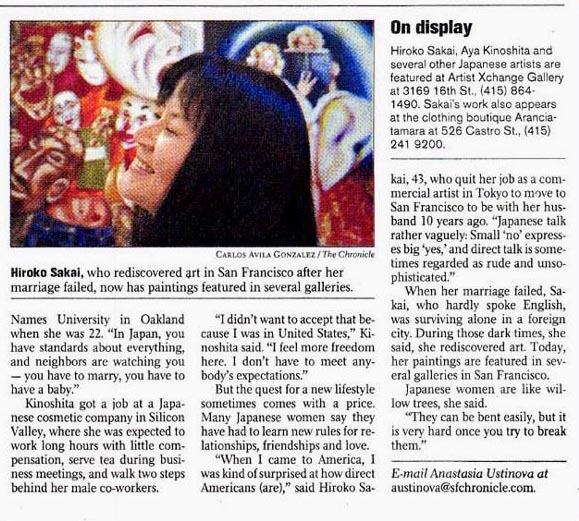 "When I came to America, I was kind of surprised at how direct Americans (are)," said Hiroko Sakai, 43, who quit her job as a commercial artist in Tokyo to move to San Francisco to be with her husband 10 years ago. "Japanese talk rather vaguely: Small 'no' expresses big 'yes,' and direct talk is sometimes regarded as rude and unsophisticated." When her marriage failed, Sakai, who hardly spoke English, was surviving alone in a foreign city. During those dark times, she said, she rediscovered art. Today, her paintings are featured in several galleries in San Francisco. Japanese women are like willow trees, she said. "They can be bent easily, but it is very hard once you try to break them."